Gas (colored purple in this artist's conception) is shooting out of the Milky Way's central neighborhood—and no one knows why. Credit: NASA/GSFC. Many galaxies are shooting material out of their cores, and in 2010 astronomers were surprised to discover that our Galaxy was one of them, giving us a front-row seat on the phenomenon. 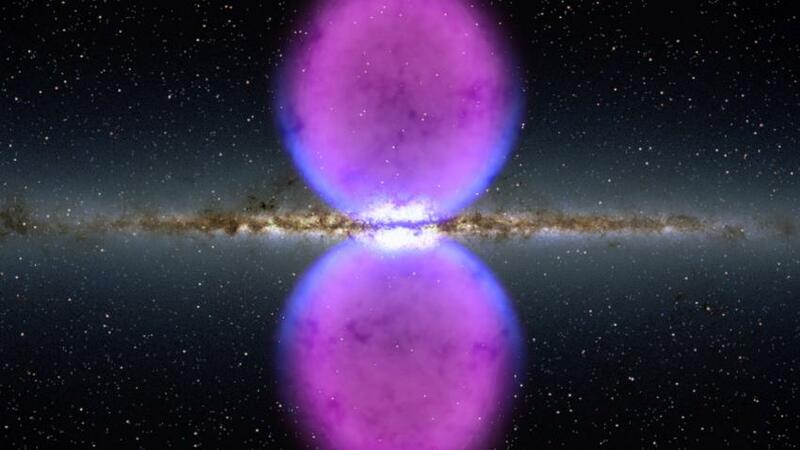 They used the Fermi Gamma-ray Space Telescope to detect two huge lobes of gamma ray–emitting gas that extend far above and below the Milky Way's center. Now other astronomers have clocked the speed of this outflow in work that may eventually resolve the key question raised by its discovery: What caused it? A black hole or a burst of star birth? The so-called Fermi bubbles tower more than 30,000 light-years above and below the plane of the Galaxy. Two chief theories exist to explain them. Perhaps material plunged toward the supermassive black hole at the Milky Way's center and, swirling around it, generated strong magnetic fields that launched huge jets of gas, which produced the Fermi bubbles. Or perhaps the Galactic downtown sparkled with hordes of new stars—a "starburst"—whose strong winds and supernova explosions cast material away. Now astronomer Andrew Fox of the Space Telescope Science Institute in Baltimore, Maryland, and his colleagues have used the Hubble Space Telescope to measure how the expelled gas is moving. "For the first time, we're really nailing down what the outflow speed is," he says. The astronomers observed a far more distant source, a quasar in the constellation Serpens named PDS 456 that lies more than 2 billion light-years behind the northern Fermi bubble. As the quasar's light zips through the Fermi bubble, carbon and silicon atoms in the gas absorb certain wavelengths of ultraviolet light. The Doppler shifts of these atoms indicate that some gas is racing toward us and some away—exactly the pattern we should see if material is spewing out of the Galactic center. As the astronomers will report in an upcoming issue of The Astrophysical Journal Letters, the speed of the outflow is 900 to 1000 kilometers per second. The velocity measurement is "a great step forward," says Douglas Finkbeiner of Harvard University, one of the astronomers who discovered the Fermi bubbles. According to Dmitry Malyshev, an astronomer at Stanford University in Palo Alto, California, "this is pioneering work" in the study of the Fermi bubbles. The speed reveals when the Fermi outflow started: 2.5 million to 4.0 million years ago. Astronomers recently gauged the age of the Fermi bubbles less directly, by arguing that whatever produced them also irradiated a long strand of gas shed by two nearby galaxies. The glow of this gas, called the Magellanic Stream, implies that the flare-up occurred 1 million to 3 million years ago. But using that argument to deduce the Fermi bubbles' age is more circumstantial, Finkbeiner says, whereas the new estimate comes from dividing the distance by the speed to get the time, something so simple a high school physics student can do it. "We see that as a good thing," Fox says. Unfortunately, neither the speed nor the age establishes how the Fermi bubbles formed—whether from black hole activity or from a starburst. But Fox's team has already used Hubble to observe more than 20 additional quasars that lie behind other parts of the Fermi bubbles. When analyzed, this data should yield velocities throughout the bubbles, which may finally unveil their origin.